This beautiful frame holds a 5x7 picture of your beloved horse. This frame is customized with your horse's name. We can add birth and departure years if you'd like them. Remember your pet for years to come even after they've crossed over the Rainbow Bridge. 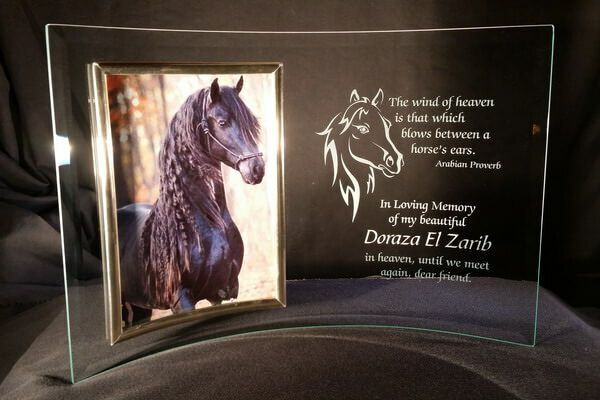 The Quote on the frame reads:"The wind of heaven is that which blows between a horse's ears - Arabian Proverb" and"In loving memory of my beautiful *name* in heaven, until we meet again, dear friend." You can completely customize this frame with different quotes - just let us know what you'd like! The Quotes are engraved with the Zapf Chancery font, your horse's name and dates are engraved with the Bible Script font. If you would like different fonts, please let us know in the comments box. Please include in the order your Horse's name.